For vinaigrette, boil Port, figs, onion and sugar in large non-stick skillet over medium-high heat until liquid is reduced to ¼ cup, about 8 minutes. Transfer to blender. Add vinegar and ½ cup olive oil; cover and blend. Season to taste with salt and pepper. In same skillet, heat ¼ cup of the vinaigrette over medium-high heat. Add garlic and Portobello slices; sauté until tender, about 4 minutes. Season with salt and pepper; remove from skillet. Add remaining tablespoon oil and chicken to skillet. Season with salt and pepper and sauté until cooked through, about 3 minutes. Toss greens with vinaigrette, bacon, and ¼ cup feta. 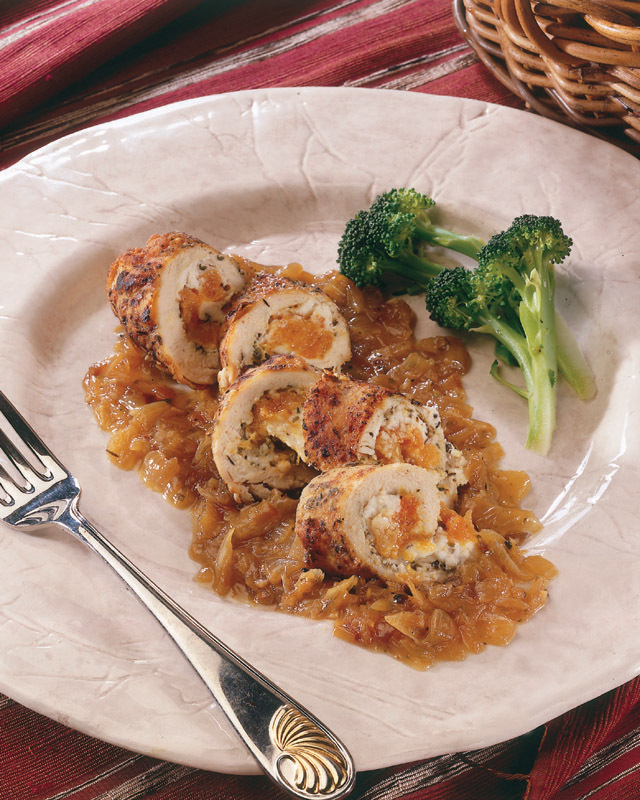 Top with mushrooms and chicken. 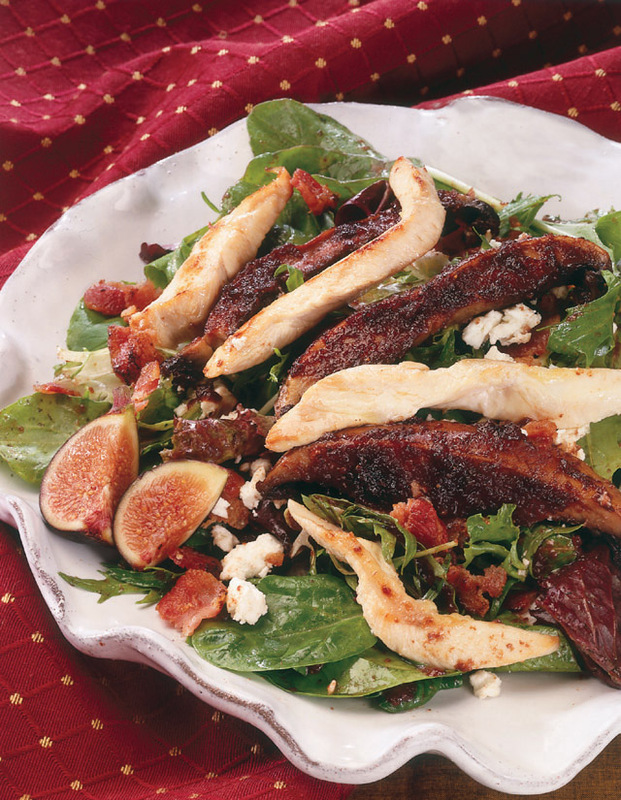 Sprinkle remaining feta over top and garnish with figs. In large mixing bowl, gently toss chicken and next 7 ingredients. 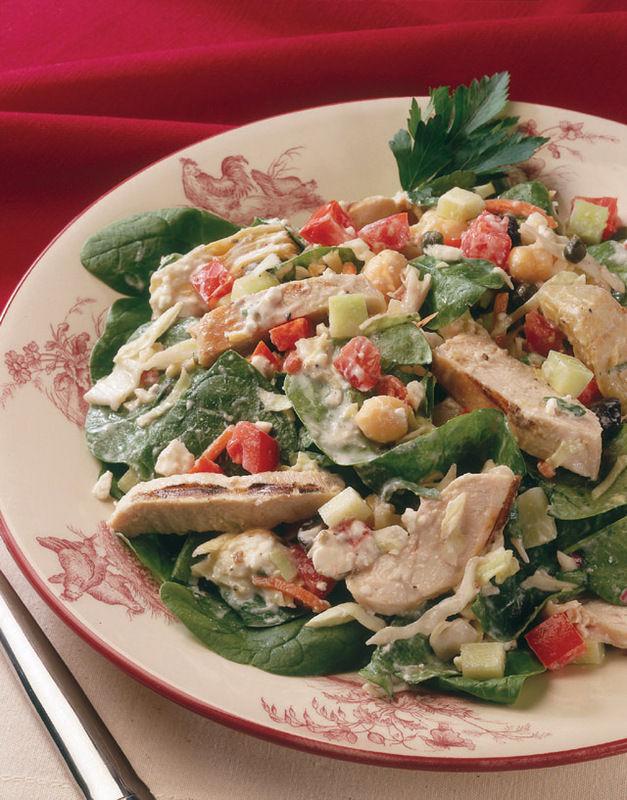 In a small bowl, mix salad dressing ingredients with the reserved artichoke liquid. Stir in salt and pepper to taste. Toss the dressing with the chicken mixture. Garnish with parsley. In bowl, mix salt, cumin, cinnamon and tumeric. Toss chicken with spice mixture. Heat olive oil and butter in large skillet over medium heat. Add chicken; cook until browned on all sides. Remove chicken; set aside. Add onion, yams, garlic, hot pepper and mustard seeds to skillet. Cook, stirring occasionally, until onion is soft, about 5 minutes. Return chicken to skillet. Stir in broth, honey and figs. Cover; simmer until yams are tender and chicken is cooked through, about 10 minutes. If desired, season with salt and pepper. 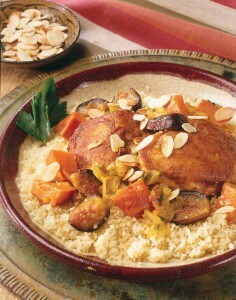 Serve over cous cous or rice. Sprinkle with almonds. In large skillet over medium heat, heat 1 tablespoon of the olive oil. 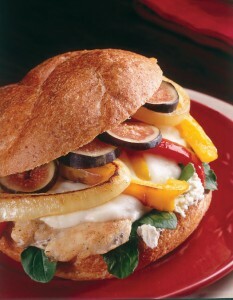 Add bell pepper, onion, ½ teaspoon of the salt and ¼ teaspoon of the pepper. Sauté until crisp-tender, about 5 minutes. Remove vegetables to bowl; toss with vinegar and set aside. Sprinkle chicken slices with remaining salt and pepper. Add remaining oil to skillet or a grill pan. Sauté chicken 2 minutes; turn and top with mozzarella cheese slice. Cook until browned and cooked through, about 2 minutes longer. Toast rolls under broiler. Spread cut sides of rolls with goat cheese. Top with arugula leaves, chicken, fig slices and onion/pepper mixture. Add roll tops. In medium bowl, combine all salsa ingredients; mix well. 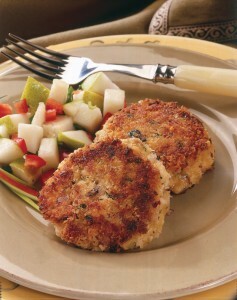 In large bowl, combine 1/3 cup of breadcrumbs, onion, cilantro, chipotle, mayonnaise, egg and salt; stir until well blended. Add chicken and cheese; mix until evenly coated. Form mixture into 8 patties, each 1/2-inch thick. Coat with remaining breadcrumbs. In large nonstick skillet over medium heat, heat oil until hot. Add chicken patties, in batches if necessary. Cook until golden brown, turning once, about 4 to 5 minutes per side. Serve with salsa. In large skillet over medium heat add 1 tablespoon each oil and butter. Stir in onions. Reduce heat to low, cover and cook 20 minutes, stirring occasionally. Add garlic and ½ teaspoon each salt, pepper and thyme; stir. Cover and cook 20-30 minutes, stirring occasionally. Onions are done when browned and jam-like consistency. Remove skillet from heat; reserve. Meanwhile, season both sides of chicken with 1 teaspoon each salt and pepper. In small bowl, mix ricotta, Parmesan cheese and remaining thyme. Spread about one quarter of cheese mixture on each breast. Equally divide apricots on one half of the long side of the chicken breast. Fold in sides and roll up jelly-roll style; secure with string or toothpicks. On a plate, mix flour and remaining salt and pepper. Dust each chicken roll with flour, removing excess. Heat a large ovenproof skillet over medium high heat; add 1 tablespoon oil. Once oil is hot, brown chicken rolls on all sides, about 1 minute per side. 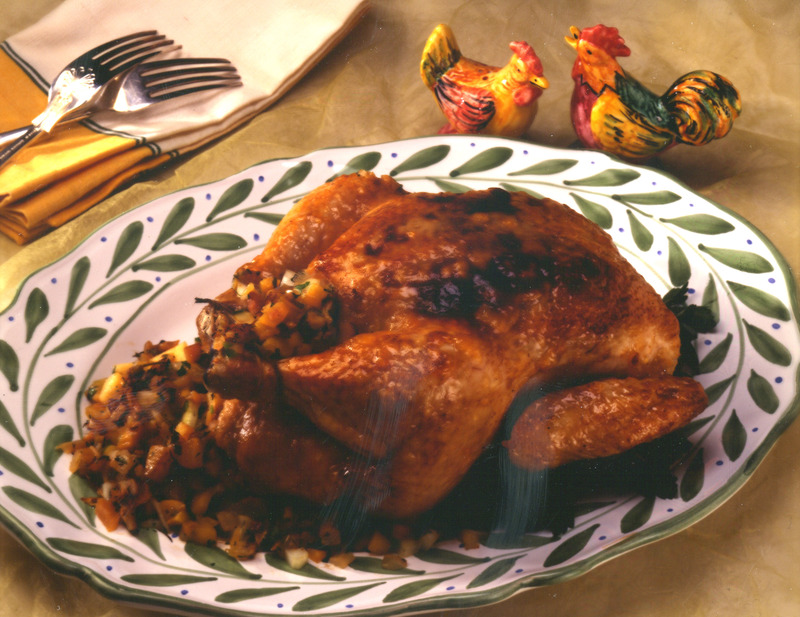 Place skillet in oven, bake chicken about 20-25 minutes, or until internal temperature reaches 165 degrees F. When done, remove skillet from oven and place chicken on platter; tent with foil to keep warm. Stir broth into caramelized onion; cook over high heat until thickened. Stir in remaining butter. Pour caramelized onion sauce over chicken. Serve immediately. Preheat oven to 375 degrees F. Rinse and dry chicken. Loosen skin on breast and thighs by slipping fingers under edge. Finely chop 1/2 cup of the peach chunks; slip under entire breast and thigh skin. Place chicken on a rack in a roasting pan. Mix remaining peaches, onion, cilantro and jalapeno; place inside chicken cavity. Sprinkle chicken with salt and pepper. Mix jam, tequila and olive oil and brush over chicken. Place roasting pan in oven and roast about 20 minutes per pound, or until done. (Thermometer should read 180 degrees F. at deepest part of thigh.) Remove from oven and let rest 10 minutes. Preheat oven to 425 degrees F. Prepare rice and bean mixture according to package directions. While rice is cooking, fry crumbled chorizo in frying pan until crisp and pieces are small; drain on paper towel. Wipe fry pan clean. Place chorizo in small bowl and mix with 4 ounces Jack cheese. Set aside. Cut into the fattest side of each chicken breast making a “packet”, making sure to not cut all the way through. Stuff each breast with an equal amount of chorizo mix; press firmly to close or secure with toothpicks. Place breasts in 9×9-inch baking pan. Place two tomato slices on each breast and sprinkle remaining 1 ounce cheese over top of all. Bake for 25 minutes. While chicken is cooking, heat enough olive oil in the bottom of the fry pan, about half-way up a plantain slice. Heat oil over high heat. Place plantain slices in hot oil and fry for two minutes per side, until slightly crispy and browned. Remove from oil, drain on paper towels; sprinkle with sugar. When chicken is done, divide bean and rice mixture among four dinner plates and place a breast on each of the mounds. 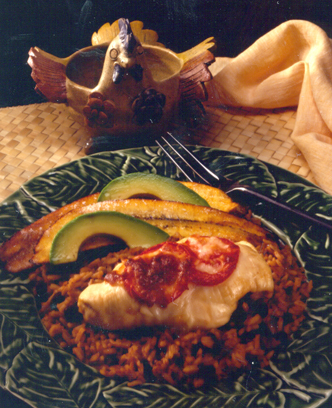 Garnish with fried plantains and avocado slices. To make marmalade, combine mango, peaches, sugar, jalapeno, lemon juice and vinegar in small saucepan. Simmer over medium-low heat 20 minutes, stirring occasionally. Remove from heat and stir in cilantro. Set aside. Combine flour, salt, ginger and cayenne pepper in a shallow dish. In small bowl, whisk eggs with soy sauce. 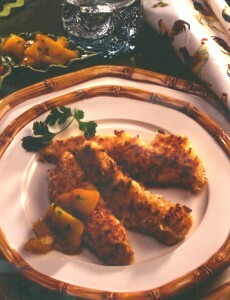 In another shallow dish, combine coconut and panko crumbs. Dredge chicken in flour mixture, dip in egg mixture, then coat with coconut mixture, pressing to adhere. Heat oil in nonstick skillet over medium-high heat. Add chicken and saute 3-4 minutes per side, until golden brown and cooked through. Garnish with cilantro and serve with Mango-Peach Marmalade. In a medium bowl, combine chicken, onion, breadcrumbs, egg, Worcestershire sauce, parsley, thyme, oregano, 1 teaspoon salt, 1/8 teaspoon black pepper and red pepper flakes. Mix until well blended. 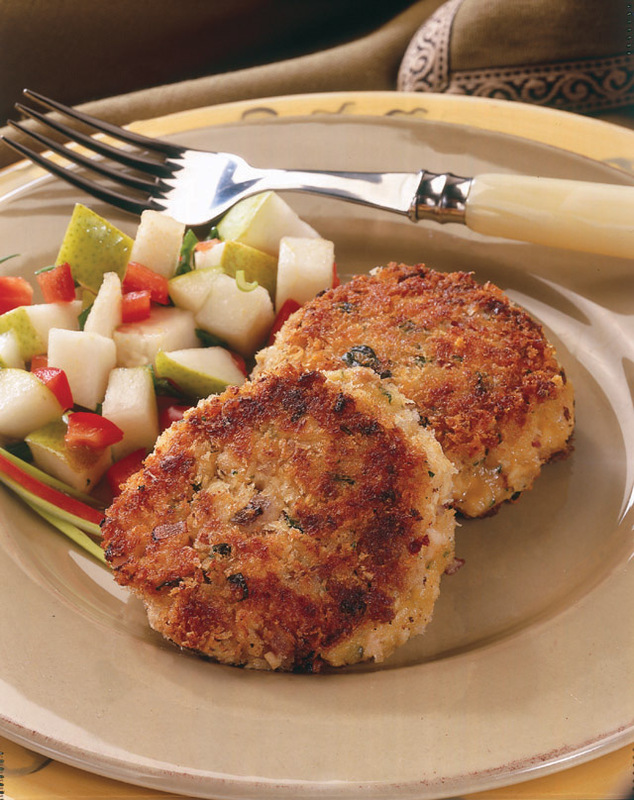 Shape chicken mixture into 1-inch balls placing meatballs on a rimmed baking sheet. Cover with plastic wrap; freeze until firm, about 2-1/2 hours. When ready to cook, remove meatballs from freezer and let stand at room temperature until slight soft on outside, about 20 minutes. In large skillet, heat oil over medium heat; add meatballs. Cook, stirring occasionally, until well browned and almost cooked through. Transfer meatballs to paper towel-lined plate to drain. Meanwhile, cook, drain and rinse soba noodles according to package directions; set aside. Place chicken broth, water, carrots and celery in large shallow saucepan; bring to a boil over medium-high heat; season with remaining salt and black pepper. Add meatballs. 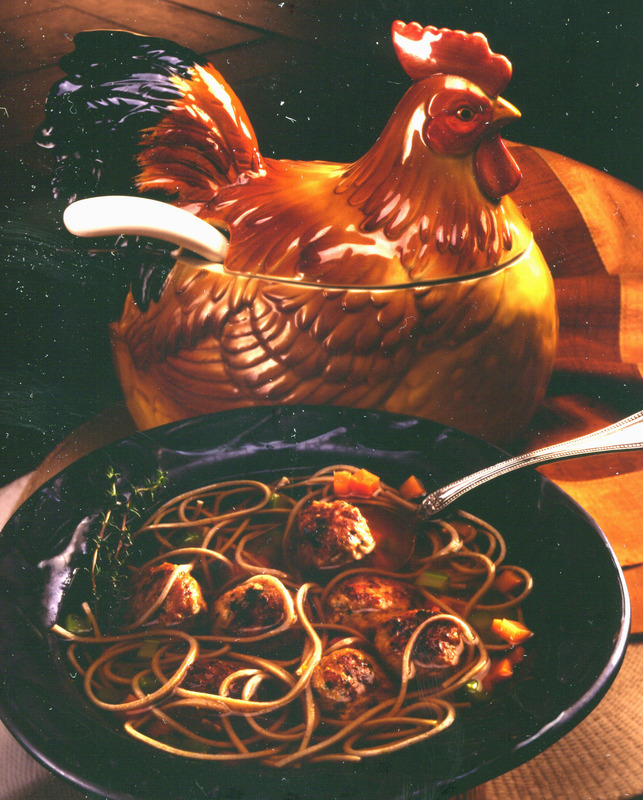 Reduce heat to medium-low; simmer until meatballs are cooked through, about 10 minutes. Add cooked noodles to broth mixture; cover and set aside. 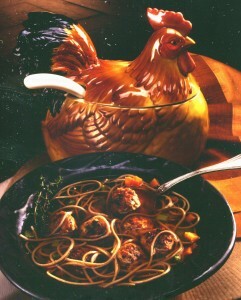 To serve, spoon four or five meatballs into 4 soup bowls; ladle broth and noodle mixture equally over top of meatballs. Garnish with thyme sprigs. Serve immediately.